In medical school, no one teaches you how to let a patient die. Jessica Zitter became a doctor because she wanted to be a hero. She elected to specialize in critical care—to become an ICU physician—and imagined herself swooping in to rescue patients from the brink of death. But then during her first code she found herself cracking the ribs of a patient so old and frail it was unimaginable he would ever come back to life. She began to question her choice. Extreme Measures charts Zitter’s journey from wanting to be one kind of hero to becoming another—a doctor who prioritizes the patient’s values and preferences in an environment where the default choice is the extreme use of technology. In our current medical culture, the old and the ill are put on what she terms the End-of-Life Conveyor belt. They are intubated, catheterized, and even shelved away in care facilities to suffer their final days alone, confused, and often in pain. In her work Zitter has learned what patients fear more than death itself: the prospect of dying badly. She builds bridges between patients and caregivers, formulates plans to allay patients’ pain and anxiety, and enlists the support of loved ones so that life can end well, even beautifully. Filled with rich patient stories that make a compelling medical narrative, Extreme Measures enlarges the national conversation as it thoughtfully and compassionately examines an experience that defines being human. Jessica Nutik Zitter, M.D., MPH, is an expert on the medical experience of death and dying. She attended Stanford University and Case Western Reserve Medical School, and completed her residency in internal medicine at the Brigham and Women’s Hospital in Boston. She was a fellow in pulmonary and critical care medicine at the University of California San Francisco. Zitter is double-boarded in the two specialties of pulmonary/critical care medicine and palliative care medicine—a rare combination. She writes for The New York Times, The Huffington Post, Pacific Standard, The Atlantic, and Journal of Palliative Medicine, and is featured in Extremis, an Oscar-nominated Netflix documentary about end-of-life decision-making in an ICU. "Like Atul Gawande's Being Mortal, Zitter's book shows how knowing when do to nothing is as vital to being a good doctor as knowing when do to everything." "Part memoir, part exposé, this book is an insider's view of intensive care in America and its impact on how we die, written by a physician uniquely positioned to examine end-of-life care. Dr. Jessica Zitter’s wisdom derives from a career whose trajectory – she specializes in both ICU and palliative medicine – models a rethinking of care for the dying. Her book is a trenchant critique and a clarion call for end-of-life care that aligns with what each patient values most." "With compassion, intelligence, and a rare expertise, Jessica Zitter shines a light on some of the most difficult issues we face in our lives." "You wouldn't take a trip to a foreign country without learning as much as you could about its rituals, its culture, and its landscape. The ICU, a place many of us will pass through at least once in our lives, is as foreign as it gets. Thus Dr. Zitter provides an essential illumination for her fellow humans." 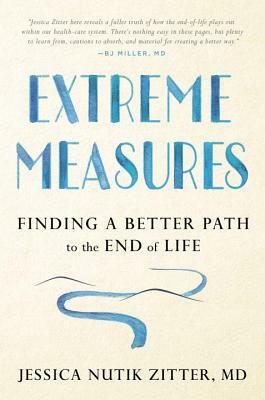 “Extreme Measures provides a gripping and intimate tour of the experiences and dilemmas physicians, patients and families face dealing with terminal illness in the modern ICU. A tour de force for those seeking to better understand and improve care of patients and families at end of life." "Clarity and compassion unite in this touching and convincing new conversation on comfortable, patient-centered end-of-life care."